November 06, 2018 at 9:39 pm. 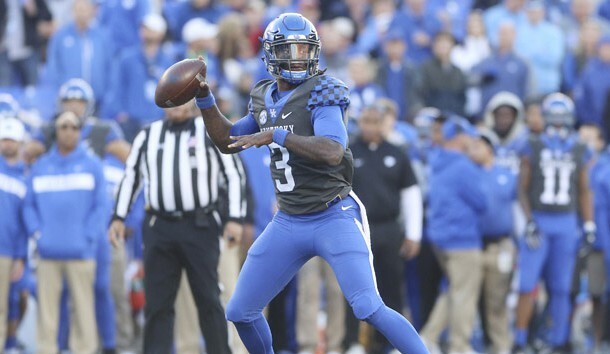 “Like I talked last week, the situation is going to change every week,” Kentucky coach Mark Stoops said. “This is a different situation. We’re going on the road. We’re playing Tennessee at Tennessee with our last league game. “We didn’t block very well,” Pruitt said. “We basically got whipped at the point of attack. We had some mental errors that we haven’t been having for quite some time. Leading rusher Tim Jordan (414 yards) managed only 18 yards on four carries. Quarterback Jarrett Guarantano was 16-of-21 passing but for a so-so 172 yards. The good thing: He hasn’t thrown an interception since the fourth game of the season when he threw two in a loss to Florida. The Wildcats also had difficulty establishing the run last week in their 34-17 loss to No. 5 Georgia, failing to get to 100 yards for the third time in the last four games. Running back Benny Snell tweaked an ankle in the first quarter but returned and rushed for 73 of the team’s total of 84 yards. “He’s a tough guy,” Pruitt said. “They do a lot with him, lots of Wildcat, so he can obviously handle what they do. They used him a lot as a freshman, which is the last time I coached against him. As was the case with Florida earlier in the year, when the Wildcats snapped a 31-game losing streak to the Gators, Kentucky will be trying to end anther skid against the Vols. The Wildcats haven’t won in Knoxville since 1984, losing 16 in a row in Neyland Stadium. “I think just beating Tennessee is important to us,” he said. “Whether there’s a streak involved or not, why would that make a difference to our team? They don’t know anything about 34 years ago.